Detailed Description: Schneider Electric/Square D I-Line® Powerpact® QG 3-Pole Molded case circuit breaker has Q-frame. It can be used for power distribution, load side lug terminals and has thermal magnetic tripping method. It measures 4.500 Inch x 3.930 Inch x 6.470 Inch and has I-line style plug-in type connection. It has a current rating of 150 Amps and voltage rating of 240 VAC at 50/60 Hz. It provides protection from overload and short circuit. It can accommodate aluminum/copper lugs of size 4 - 300 AWG/kcmil at the load. 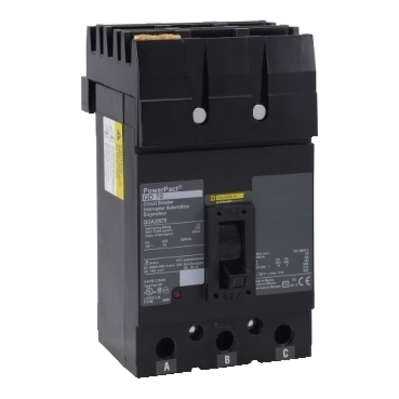 The 3-Phase circuit breaker has an interrupt rating of 65 kilo-Amps and trip setting of 1200 - 2400 Amps. Circuit breaker is UL listed/CSA approved/IEC rated and meets NOM, Fed. Specs W-C-375B/GEN standards.